Bridgestone’s new BT-016 Pro are the Japanese firm’s latest all-round sports tyres, an evolution of the standard BT-016 using MotoGP technology, it sits between the BT-003 Street and race tyre and their BT-023 which is designed for sports touring. The standard BT-016 is still OE on many sports bikes like Suzuki’s new GSX-R600 and GSX-R750. Bridgestone claim they have improved the new BT-016 Pro in three key areas: higher levels of grip, better stability and longevity. For improved grip they’ve optimized the contact area the compound performance (remember the BT-016 has three different compounds). Stability comes from new RC Polymer which they claim means the tyre works better over a wider range of temperatures, and also leads to improved wet weather grip. To extend the life, Bridgestone say the front will last 60% longer and the rear 20% on average, but obviously all bikes are different. Bridgestone have made slight improvements in dry performance of the old BT-016, with more cornering and straight line stability, but wet weather performance is where we’re said to expect the most significant improvement. 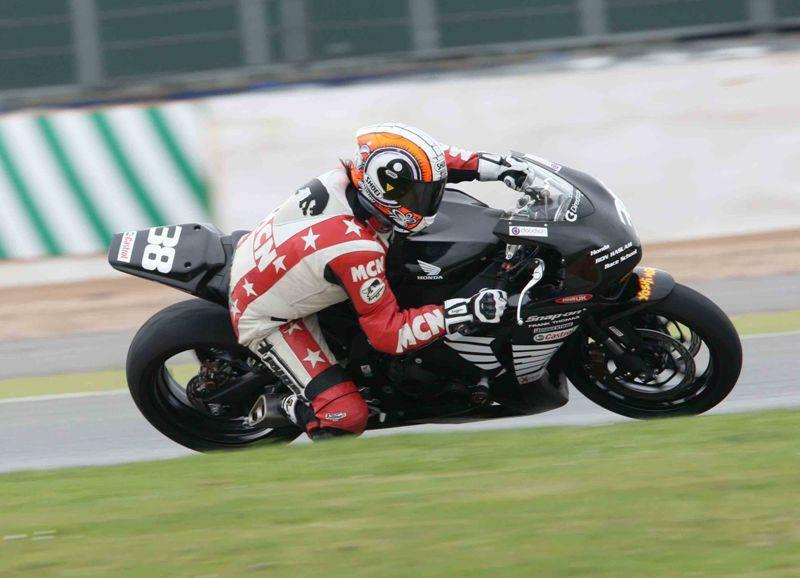 Bridgestone teamed up with the Ron Haslam race School at Silverstone to launch their new rubber. For reference the track temperature was very low, single figures between 6-8 degrees and the track was very 'green' as it hadn’t been used for a long time over the winter break. Initially on my first outing onboard a Honda Fireblade I was impressed with the grip in the cold conditions. The rear warmed up quickly, and within a few laps was encouraging me to dial in the power earlier and harder. The level of rear grip and feedback was really impressive. However, in these conditions the front wasn’t inspiring confidence into the tight chicanes in the early morning sessions – there was a tendency to understeer and I suffered the odd small slide when really pushing the front. In the fast corners (third gear and above) they were faultless, however, with loads of grip, feedback and stability from the front. It’s just that trail braking into slow first gear corners didn’t offer the same level of confidence. I put this down to the temperature of the track, the lack of rubber down owing to its lack of use over the winter, and in part to the Fireblade’s linked brakes, which don’t let you bury the front into a turn. Later in the day, with the sun high in the sky, I took a CBR600 out for a few fast laps. The front performed far better later in the day, it was possible to carry much more front brake deep into the turn, pushing the front tyre. With greater feeling and feedback confidence was restored. To sum up I’d highly recommend them for road, and occasional track use. They’ll take all you can throw at them on the road and only dedicated track day riders will find their limitations when pushing for fast laps. I’d be interested in trying some on my road bike – a 2009 Yamaha R1 to see how they perform in cold temperatures again. Avon VP2 Sport, Pirelli Diablo Rosso 2, Continental Conti Sport Attack, Dunlop SportSamrt, Maxxis Supermaxx Sport, Michelin Power Pure, Metzler Sportec M5.